It’s the great Australian dream. The scent of saltwater on the breeze. Mornings spent with sand between your toes. Picnics on the shore. Surfing, boating, swimming or sunbathing on demand. And there’s your beautiful home – just down the street from all of it. If this is your dream too, we salute you. We’re also trying to make that dream accessible to you – that’s why we are developing this northern coastal community of Atlantis Beach, and offering affordable houses & land near the beach. Many Australians tell themselves a home by the coast is impossible – but we beg to differ. Read on to get inspired about your future home. Let’s feed that dream with some inspiration for building on the coast. Imagine a coastal fortress of fun & relaxation. Plenty of room for friends, family, fun… and even toys like boats, pool tables and workshops. That’s the kind of home The Oder is. This dream is actually one of our house and land packages at Atlantis Beach. Included on its 510m lot are 4 beds, 2 baths, a double garage, a separate activity room, a games room, an alfresco – and then the usual features you’d expect like kitchen, living, and dining plus a master suite complete with large bathroom. Whew! Sounds like fun, hey? See more details on The Oder – from $421,990 in Atlantis Beach. Sometimes Australians assume that if they did go for a property in proximity to the coast, they’d have to look a bit smaller, and maybe set a lower bar for the appliances and finishes inside. Living by the beach doesn’t have to mean sacrificing space or quality! The Camden is a 4 bed, 2 bath beauty with a two-car garage and the kind of class that creates a bit of a ‘wow’ factor as you walk through the home. Some highlights are the SMEG kitchen appliances, Essa-stone bench top, large format floor tiles. Wouldn’t mind coming home from the beach, showering off and kicking up our heels amongst all that! Get more details on The Camden – from $302,890 in Atlantis Beach. One of the biggest dream-busters when it comes to that beachside life is affordability. For many Australians, the mere thought of a home near the coast triggers the ‘impossible price tag’ alert. But here in northern Perth, that’s not the case. The Rhea is a 3 bed, 2 bath home with garage that starts from $278,900. And similar to the Camden, this package features inclusions that would impress anyone. Gourmet kitchen? Yep. Paved alfresco? Don’t mind if we do. Soft closers to all cupboard and drawers? You bet that makes an impression! Get more details on the Rhea – from $278,900 in Atlantis Beach. Curious about Atlantis Beach? Why not Come for a Visit? It might look and sound like it, but Atlantis Beach is not an imaginary place. It’s north of Perth, but not too far – and the distance is mostly covered by train service. 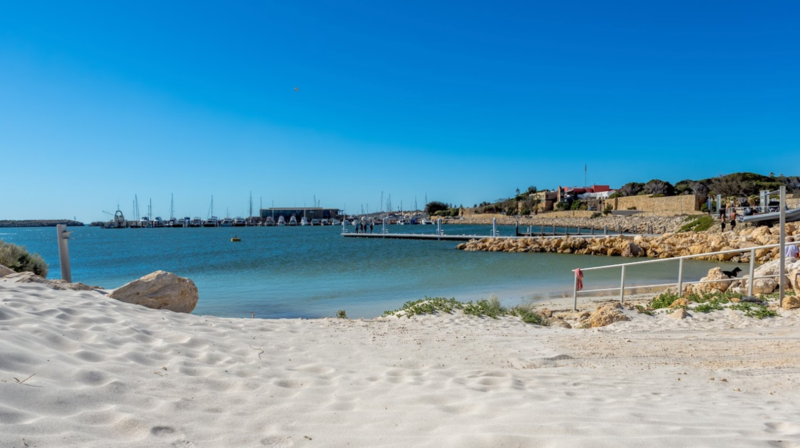 In fact Two Rocks is just 10 minutes from the train station in Yanchep. So come up for a visit, see our community – and bring a towel for the beach!